The most comprehensive New York bus tour! ick up at Jolly Madison Hotel (08:30) or Sheraton New York (09:00). The first featured stops are at Lincoln Center, Central Park West, the Dakota Building, the Upper West Side and Harlem. We’ll drive through the American Museum of Natural History, the Guggenheim Museum, the Metropolitan Museum, Museo del Barrio and the Frick Collection, and later through Fifth Avenue, Rockefeller Center, Radio City Music Hall, with a stop at United Nations for a stunning view of the Chrysler Building, followed by another stop in front of the Flatiron Building, including a view of the legendary Empire State Building. We continue downtown toward Greenwich Village through Bleecker Street, SOHO, and a stop in Little Italy for a guided walk to Chinatown. We later reach the Brooklyn Bridge, and we stop for a panoramic view of the Manhattan Bridge and Brooklyn. In English, narrated by one of our professional Tour Guides. Aboard the bus you will see the Upper West Side, brownstones in Harlem, Lenox Avenue, Greenwich Village through Bleecker Street, SOHO, exteriors of American Museum of Natural History, Guggenheim, Museum, Metropolitan Museum, Museo del Barrio, Frick Collection. 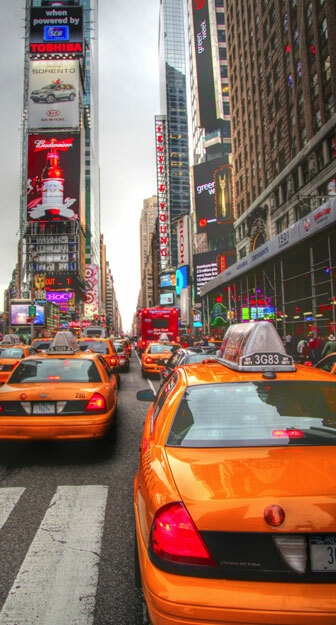 We will drive through Fifth Avenue, Rockefeller Center, Radio City Music Hall, Wall Street, the Financial District, the West Highway. Please note: Tour itinerary may be modified during special events (Parades, Marathon, traffic conditions). Services are automatically confirmed upon reservation provided that the origin or destination is within Manhattan. Rates are applicable to one pick up and one drop off only. 60 minutes free waiting time given on all domestic flights from the official posted arrival time. 90 minutes free waiting time on all international flights from the official posted arrival time. Additional waiting time will be calculated in increments of 15 minutes at the vehicle hourly rate. Tax, parking and tolls to prices listed are included. Please contact us for out of town rates.